On Tuesday, Nov. 27, Brooklyn College, along with all other City University of New York (CUNY) institutions, will celebrate #GivingTuesday, a global day of giving. Funds raised will support the Brooklyn College Annual Fund, which helps the college continue to create a complete and fulfilling college experience by providing resources that immediately respond to the urgent and evolving needs of the students, faculty, and campus. The following story is an example of how giving plays a crucial role in student success. 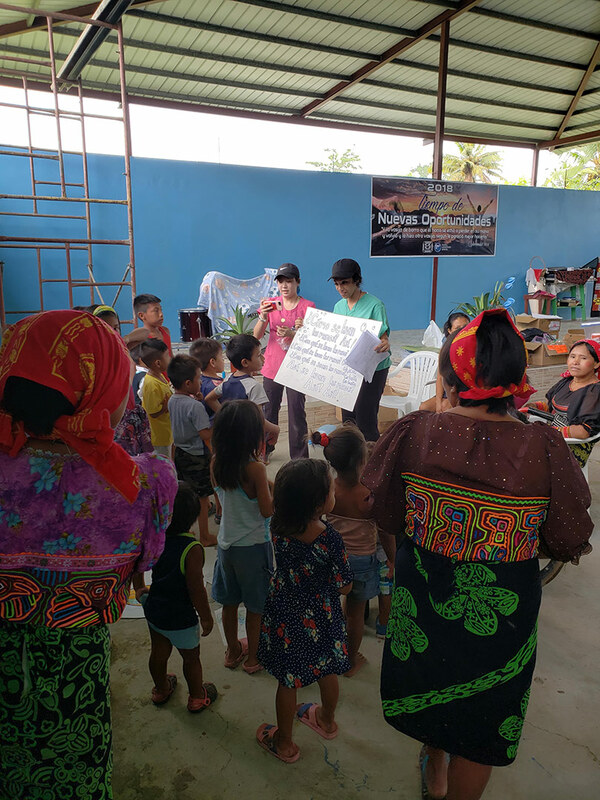 With the generous support of Bernard H. '62 and Ethel B. Garil, Brooklyn College Global Medical Brigades students got the opportunity to work with indigenous communities in a manner that prioritized holistic prevention and empowerment. To have a positive impact on the lives of over 18,000 Brooklyn College students, make a contribution today at the #GivingTuesday website. The Brooklyn College Global Medical Brigades (BCGMB) are welcomed at the Maria Elena Diaz School. Sadiya Hoque (left), Raisa Santos (center) pose for a photo during their trip to Panama with the BCGMB. Santos takes the pulse and blood pressure of a patient. Brooklyn College students engage in educational games with Panamanian village children. Hoque (right) helps lead the children in song. 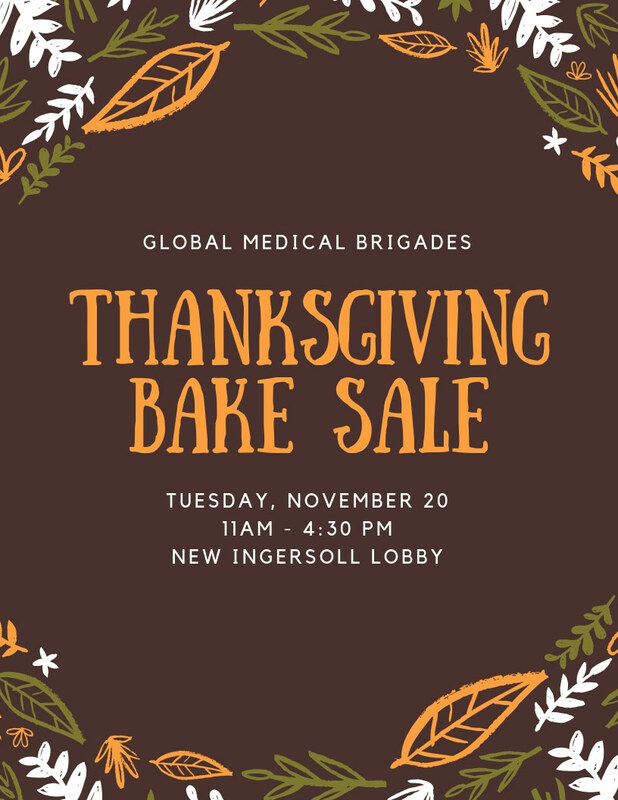 The BCGMB encourages you to join them for their Thanksgiving Bake Sale, which will take place on Tuesday, November 20, 2018, 11 a.m.–4:30 p.m. in the lobby of the Ingersoll Extension. Brooklyn College senior Raisa Santos and sophomore Sadiya Hoque know the importance of understanding the political and structural problems facing developing nations and their citizens. 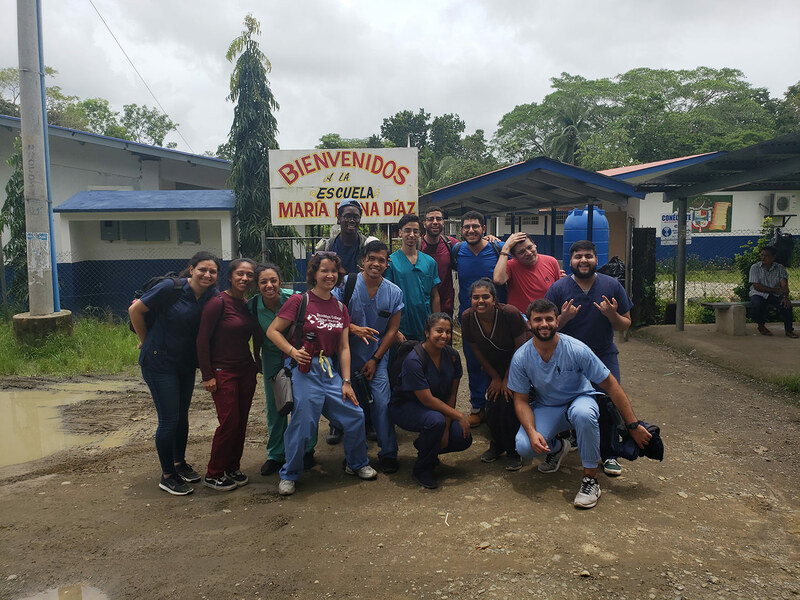 As members of the Brooklyn College Global Medical Brigades (BCGMB), they joined 11 other Brooklyn College students, and Ernesto Cuba of the Graduate Center of The City University of New York, on a weeklong trip to the towns of Cañazas, Guacuco Guna, and Guacuco Latino in Central Panama this past August. There, they spent time with the indigenous Embera-Wounaan and Ipeti Embera people, and shadowed and assisted doctors, dentists, and pharmacists while they treated patients for ailments such as muscle aches and foot pain, gave fluoride treatments to children, took temperature and blood pressure readings, and provided consolations on preventative care. "It's really humbling. Being there makes me ask myself, 'How much help am I really providing these people,'" says Santos, president of BCGMB, member of the Scholars Program, intern for the English Majors' Counseling Office, and editor for the college's student literary magazine, Stuck in the Library. Santos is also double majoring in chemistry and creative writing. "You realize even if you're making the smallest of differences, it matters. We just have to ensure that the way we contribute is institutionally and communally sustainable, so that the people we assist no longer have to depend on outside sources to meet their basic healthcare needs." 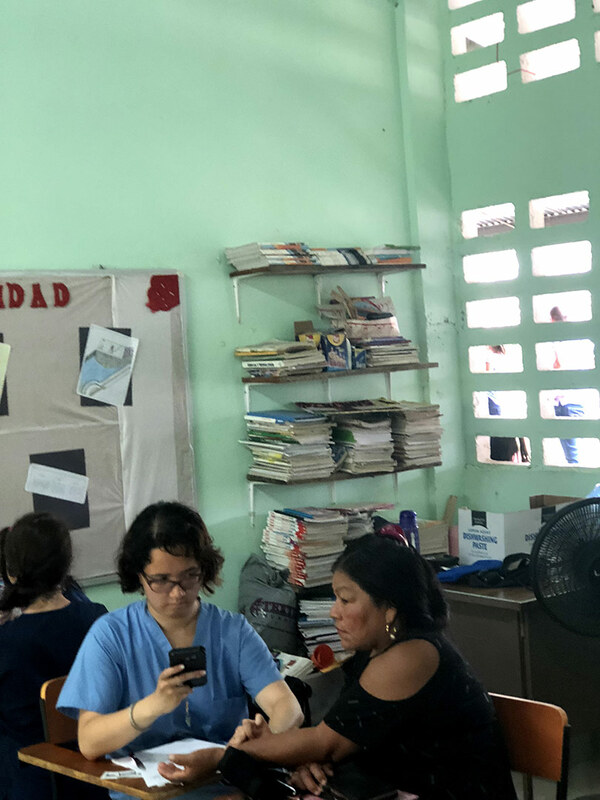 The Global Medical Brigades is a nonprofit international organization that promotes student-led health and sustainable projects such as medical care, clean water, and affordable housing initiatives. It relies on student groups at colleges and universities to recruit volunteers to run the programs. After establishing a brigades presence on campus, students then must build a strong community that will have the stamina and means to finance their mission and complete their goals. 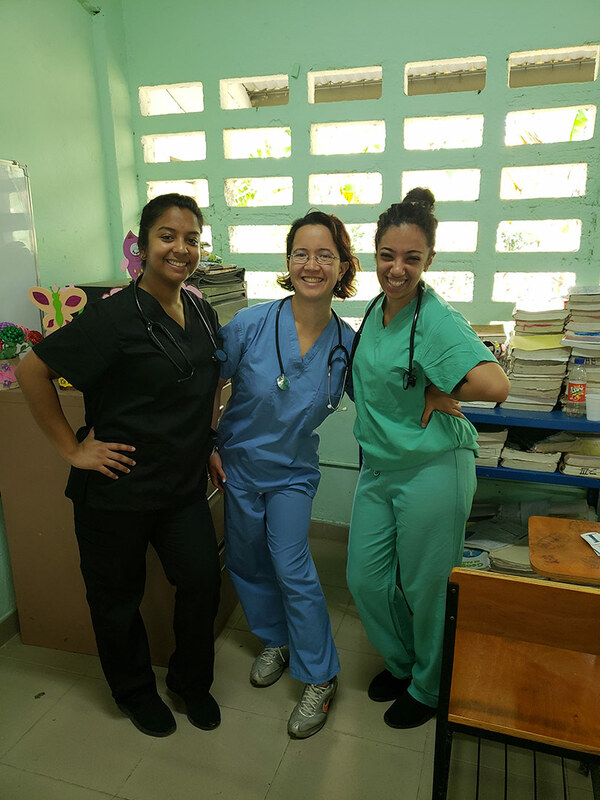 Working closely with trained medical professionals and receiving intensive on-the-job training, the students engage in missions in Honduras, Panama, and Ghana. The trip to Panama was Hoque's first time participating in a BCGMB project. "It's a really eye-opening experience. We were able to give back to communities that were underserved, which is what's so fulfilling about participating," says Hoque, a biology major who individually raised over $1,800 for her participation in the project. "Being there solidified my commitment to being of service to the world." 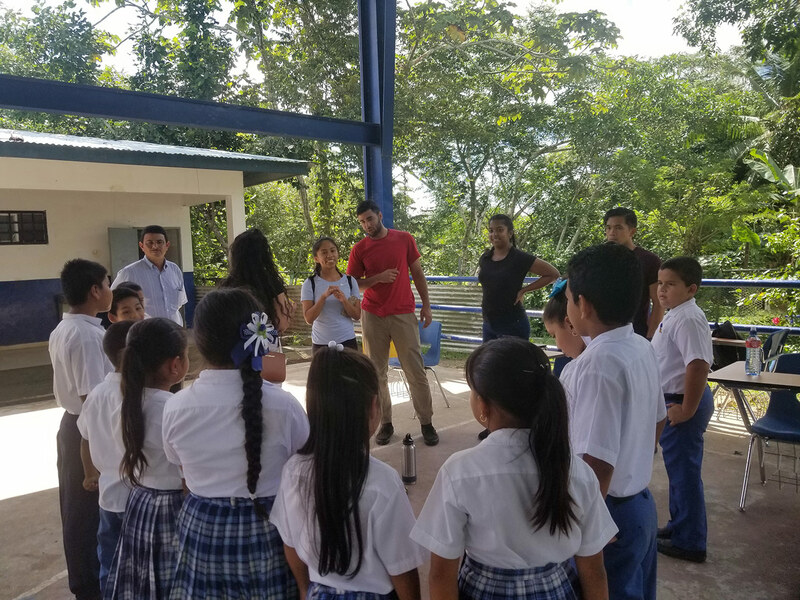 Members of the Brooklyn College Global Medical Brigades participate in educational games and traditional local song and dance with the children of the Panamanian villages they visited. Initiative is a key quality for BCGMB members. Each student engages in fundraising initiatives like bake sales, pie-eating contests, and talent shows to pay for travel, lodging expenses, toys, and activities for children, and medicine and medical supplies when they do not receive donated materials from hospitals. Sometimes, the students also use their personal funds to pay for supplies, which is why donors are crucial to BCGMB's success. Bernard H. '62 and Ethel B. Garil, longtime supporters of Brooklyn College, are generous benefactors of BCGMB's outreach and work. The Garils dedicated their lives to the fight against cancer after losing their daughter Stacey to breast cancer and son Michael to the long-term side effects of treatment for leukemia. They went on to establish several programs in honor of their children, including internships at the Dana-Farber Cancer Institute and Johns Hopkins University for Brooklyn College students intent on careers in cancer research; a breast cancer resource library for patients at Columbia Presbyterian; and research programs at Dana Farber and Johns Hopkins. "As distinct from the internships we've sponsored in our children's memory, the Brooklyn College Global Medical Brigades provides a different type of opportunity for Brooklyn College students to learn about providing for those in need of medical care and hopefully will encourage them to go on to a career in medicine," said Bernard Garil, recipient of the Brooklyn College Foundation Best of Brooklyn Award, Brooklyn College Alumni Association Lifetime Achievement Award, and the Brooklyn College Presidential Medal. Both Santos and Hoque share the goal of becoming doctors. "I will become a cardiothoracic surgeon," says Hoque. "It will be a long journey. After graduation I am looking into joining the Peace Corps for two years, at which time, I will study for the Medical College Admission Test." For Santos—a NYC Merit Council Scholar, Presidential Scholar, and Rosen Fellow—in addition to becoming a doctor, she is also looking into studying public health. After she becomes a licensed physician, she also wants to participate in the alumni chapter of BCGMB and Doctors Without Borders. "BCGMB had a profound impact on my aspirations," she says. "When I finish my applications for medical schools, I want to continue working on my creative projects." During a study abroad in Scotland, Santos wrote the first chapter of her young adult novel. Information about how to join or donate to the Brooklyn College Global Medical Brigades can be found at their fundraising site. Learn more about their upcoming events on their Facebook page. Sign up for the 2018 BCGMB Talent Show by completing the application before November 29.